October is coming out month and GU Pride, Georgetown’s undergraduate association of lesbian, gay, bisexual, transgender, queer/questioning, and allied students, has already kicked off its series of panels, discussions, and social events.The organization hosted a panel last Tuesday exploring the dichotomy of being both gay and an undocumented worker. “It’s actually relatively common that leaders within [the immigrant rights] movement also happen to identify as LGBTQ,” GU Pride treasurer, James Saucedo (MSB ’13), said. Last Thursday’s National Coming Out Day celebration in Red Square was a resounding success. “It’s possibly the most active, most inclusive coming out day or coming out week I’ve seen on campus since I’ve been here,” said Saucedo. 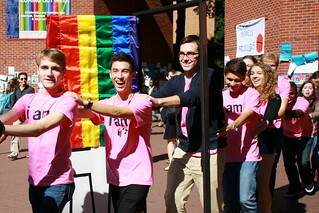 The day featured a gathering of LGBTQ and ally students wearing GU Pride’s signature “I am” shirts, this year in pink, followed by a “kiss-in,” a discussion with Senior Legislative Council for the Human Rights Campaign Ty Cobb, and an evening barbecue. Those “I am” shirts have become a tradition in Georgetown’s LGBTQ community: they act not only as a visible indicator of what Saucedo calls the “invisible identity” of those who identify as LGBTQ, but as a demonstration of solidarity among allies. Another upcoming event on October 25, titled “Coming Out as an Ally: Beyond the Basics,” hopes to address the true meaning of being an LGBTQ ally. Honoring Our Histories, Wednesday’s headline event, marked the fifth anniversary of the Out for Change Campaign with the first open question and answer session with President DeGioia on the state of LGBTQ affairs at Georgetown. “Things like this certainly wouldn’t have happened five years ago,” said GU Pride President Meghan Ferguson (COL ’15). The environment in 2007 was far more hostile towards the LGBTQ community. “GU Pride tried to deliver a letter to President DeGioia’s office, back when the university wasn’t acknowledging anti-gay hate crimes which sent students to the hospital. When students tried to deliver a petition letter to him, anybody wearing an “I am” shirt wasn’t allowed into Healy Hall. It’s something that has been a very secretive and that the university has never actually justified,” recalled Saucedo. The plan now includes an expanded blue light emergency system, the addition of a non-discrimination clause in the student housing agreement, and lays the groundwork for gender-neutral housing. Thomas Lloyd (SFS ’15) chose Coming Out Day to launch the Catholic Association of Students for Equality, a national coalition of LGBTQ student groups at Catholic universities. “The main purpose of the group is to create a support network for all of us and share our experiences of what it’s like being queer on a Catholic campus or being queer and Catholic,” explained Ferguson. With nearly ten schools on board already, the organization is off to a tremendous start.